The number of overweight children and adults around the globe has significantly increased over the last two decades. Thirty-one years ago, Len Saunders created Project ACES (All Children Exercise Simultaneously) which motivated millions of children to exercise from over 50 countries. Each year after a successful ACES event, Len would receive letters / emails from many parents asking him to create a program similar to ACES, but includes adults. These correspondences created the concept of PACES Day. 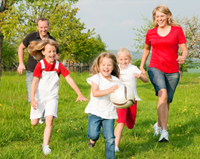 PACES is an acronym for 'Parents And Children Exercise Simultaneously.' PACES Day takes place every weekend throughout the year, highlighted on a Saturday in May. Children need daily, quality physical education in school, and exercise time at home (PACES). PACES Day teaches families an important message, which is why it has already received positive attention in the media. A family that exercises together, spends quality time together while leading a healthy lifestyle. Now, children can still enjoy Project ACES at school, but participate in PACES at home. 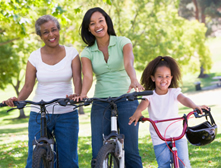 PACES Day not only promotes exercise time, but family time. Saturday, May 4, 2019 will celebrate the Twelfth annual PACES Day. PACES Day will always take place on the first Saturday in May that follows Project ACES Day. On this day, parents will exercise with their children for 15-45 minutes sometime throughout the day. This web site offers many great ideas of what your family can do on PACES Day. You can also download the 52 weeks of fitness work sheet on the downloads page for some other great ideas. Parents play a key role in the growth and development of their children. They are also the most influential role models in their children's lives. Most children understand that their parents work very hard throughout the work week. The weekends are normally family time. Not only will families sign up to exercise together on PACES Day, but they are now committing to exercise every Saturday as a family. PACES Day is not a once a year event, but a weekly event. The main day (first Saturday in May after Project ACES) will bring families together from all over the world as they will exercise together to promote family wellness. This is the motivational tool for the children. 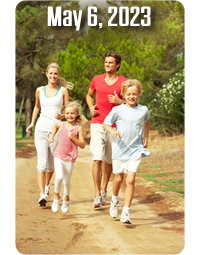 PACES Day is meant to kick start an exercise session with the family. Now you can enjoy two wonderful programs each year to get you up and moving. Project ACES will always take place on the first Wednesday in May, while PACES Day will always take place the first Saturday following Project ACES Day. Always remember, both programs are more that just once a year events. Sign up for PACES Day today. When you sign up, your family name will be recognized on this web site with other families from around the world, which is a great motivational tool for your children to participate. They will enjoy seeing your family name on this web page. You don't need to wait until May 2019 to start your weekend exercise routine with your family. Tell all the families you know about PACES. The word of mouth is what made Project ACES a huge success, and the same can happen with the PACES program. If you are a Physical Education teacher, here is a way to motivate your children to exercise at home. Tell the students to share information about PACES with their parents. The same applies to coaches, recreation departments, and health clubs. Share the information with your neighbors, schools, and friends to get them involved. Tell your fellow employees at your work place about PACES Day. Let's make the twelfth annual PACES Day in May 2019 a huge success. Remember to sign up today so your family is recognized as participating with the millions worldwide. IT'S FREE! Most families use the weekends for family time. Now, each Saturday, families can commit to exercise together to get healthy together. The most influential people to motivate children to exercise are their parents. Now is the time to show your children you exercise, and you want them to participate along with you. Health habits that start at a young age will continue for a lifetime. Len Saunders, the creator of PACES Day has released his book entitled, Keeping Kids Fit. Visit the book website to learn more about this great resource of children's health and fitness information. "I am the Physical Activity Coordinator of the Network for a Healthy California - San Diego and Imperial Region. I am contacting you because I will be hosting a PACES event and there will be over 400 families invited to this event. We will be having everyone participate in simultaneous activity for part of the event." View a letter of support from The President's Council on Fitness, Sports, and Nutrition by clicking here. Thank you to the President's Council for your continued support of Project ACES and PACES Day. Exercise with families around the world! PACES takes place throughout the entire year! Get a medical checkup before starting any exercise program. Start your families weekly exercise event today. Sign up now. Sign up for PACES Day today!! Copyright © Len Saunders - Supported by The Youth Fitness Coalition, Inc.